Recent years have seen a dramatic uptick in the number of men choosing to try testosterone therapy drugs such as Androgel as a means to combat some of the negative, yet common, side effects of aging, or “Low T.” This development has followed closely on the heels of an unprecedented onslaught of advertising from pharmaceutical companies touting such treatment as a safe, effective way to reclaim a youthfulness most everyone desires. Unfortunately, evidence has been mounting that Androgel and similar medications pose a serious risk of heart attacks and other potentially life-threatening health conditions in large segments of the population they were intended to treat. As a result, lawsuits against the makers of this and other such drugs are continuing to make their way into the courts. 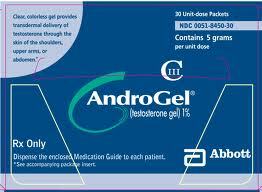 Produced and marketed by Abbott Labaratories subsidiary AbbVie, Inc., Androgel is one of the most popular pharmaceutical products used to treat symptoms typically associated with low levels of testosterone in males. Over the past several years, however, many men who have been experiencing some of the dreaded effects of aging, including low libido, low energy and occasional forgetfulness have turned to testosterone replacement as a way to feel young again. While Androgel received FDA approval only as a treatment for men suffering from the condition known as hypogonadism (insufficient hormone production), the majority of men now using the medication have never been diagnosed as having it. Sadly, their quest for youth may have caused them to needlessly incur very serious risks of dangerous testosterone side effects, with heart attacks being foremost among them. While each of these outcomes is alarming on its own, it has become quite apparent that the most dire risks posed by Androgel are those of heart attacks and other potentially deadly cardiovascular events. Several recently published research studies suggest that the problem is far more serious than many initially believed and that significant further study is warranted. The PLOS ONE medical journal published a study which found that men under the age of 65 who had a prior history of heart trouble had two times the risk of suffering a heart attack once they started taking testosterone therapy drugs. Men over the age of 65 also saw a jump in their risk of a life-threatening cardiovascular complication within the first 90 days of using the treatment. The Journal of the American Medical Association published a study undertaken by the Veterans Administration which also suggested a close link between Androgel and similar drugs and a heightened risk of fatal heart attack or stroke. Male subjects using testosterone therapy who also had a history of heart issues experienced a 29 percent increase in risk over similar male subjects who did not use the treatments. In response to these findings and growing concerns, the U.S. Food and Drug Administration decided in January of 2014 to conduct a comprehensive investigation of testosterone therapy medications and their potential link to heart attack and stroke risk. At the same time, consumer watchdog group Public Citizen called on the FDA to strengthen the labeling requirements for Androgel and other such drugs, alerting the public to the risks they are widely thought to pose. In September of 2014, FDA advisory panels determined that drug manufacturers should begin conducting new trials to help assess the level of risk these treatments present to patients. February, 2014 saw the first of what would become many Androgel lawsuits filed by plaintiffs who claimed serious injury resulting from testosterone therapy. Plaintiffs in these cases all experienced strokes or heart attacks after beginning their use of testosterone treatments and claim that Abbvie, Inc. engaged in misleading marketing practices, breached warranties, disguised known risks and failed to warn the public of the dangerous nature of their product. It is argued that the drug maker aggressively represented Androgel as a virtual fountain of youth to male patients who most likely did not even have the medical condition for which the treatment received FDA approval. As the number of Androgel plaintiffs increased, a motion was filed with the U.S. Panel on Multidistrict Litigation to consolidate all testosterone therapy lawsuits into a unified Multidistrict Litigation (MDL). The motion was granted, and now all federal lawsuits pertaining to testosterone products will be overseen by Judge Matthew F. Kennelly in the U.S. District Court for the Northern District of Illinois. The MDL process allows for streamlined discovery in cases with similar claims, facilitates consistency in pre-trial rulings and serves as a conduit for possible settlement negotiations. Well over 200 lawsuits are currently pending in the MDL, and six bellwether Androgel trials are scheduled to occur between October, 2016 and April, 2017. These trials were chosen because the are representative of the allegations and legal theories lodged by multiple other plaintiffs, and their outcomes give the parties a strong indication of how subsequent juries may respond to certain testimony, evidence and arguments. Likely candidates for filing an Androgel lawsuit are male patients who began using the testosterone therapy treatment and subsequently experienced a stroke, heart attack or other serious side effect. Because it will be necessary to establish that use of Androgel did in fact lead to the medical complication and produce the resulting damages, expert testimony will play a critical role in each plaintiff’s ability to secure compensation. Emerging research relating to testosterone and heart attack risk may indeed play an important role as these cases progress. The tremendous popularity of Androgel and other similar Low T therapy drugs virtually guarantees that litigation relating to the list of purported side effects will only increase going forward. Precisely how many cases will be added to the MDL or how willing AbbVie may ultimately be to engage in settlement discussions are key elements which still remain to be revealed. In the meantime, dangerous drug attorneys nationwide are continuing to review cases and assess potential claims.